﻿ Some Ways to Get New and Repeat Business with Email Automation » Red Mango Marketing! If you’re like many of the small businesses we talk to, it’s likely you’re concerned with finding new customers, not having enough time to do everything you need to do, and retaining existing customers. Today, I’ll provide some practical email marketing automation ideas to solve for each of these concerns. But first, I’d like to challenge you to flip this list a bit by putting retaining new customers at the top. Why? Because I want you to work smarter and not harder. Take a moment to consider that, according to the Harvard Business Review, gaining a new customer can be five to 25 times more expensive than retaining an existing one. And Bain & Company has found that if you can increase your retention rates by just five percent, you can increase profits anywhere from 25 to 95 percent. I like the way that sounds. I’m sure you do too. These stats support the idea that it’s important to focus on relationships with your existing customers. One of the easiest ways to create and grow those relationships is with email marketing. Email marketing allows you to reach people in a place they visit every day, the inbox. DMA Insight has found that 99 percent of consumers check their email at least once per day on their smartphones. Email feels more personal than social media because your subscribers have invited you into a private space, their inbox, versus the more public setting of social media. It’s this personal nature, coupled with the fact that it’s an opt-in marketing channel, meaning people have permitted you to contact them, that makes email marketing so effective. But today your customers expect more from you in the form of personalized communications. According to Salesforce, 52 percent of consumers are likely to switch brands if a company doesn’t personalize communications. So what do we mean by personalized? First, don’t think of it as blasting out an email to many people. Instead, behave as though you’re sending one message to one person. Mimic what the conversation would be like if you were face to face with your customer. Second, the offers, information, and conversations you’re having with your customers should feel timely and relevant. If your messages miss the mark here, you’re likely to get lackluster results. Keep in mind, Experian has found that personalized emails deliver six times higher transaction rates. The good news is that when it comes to personalization, you have a considerable advantage over the big guys. You’re often face-to-face with your customers. You know them personally. With this information in mind, how can you use email in the most effective way to get new and repeat business? Question for you, do you think it’s easier to reach people when you have their contact information or when you don’t? When you have an email address, you’re able to influence whether or not someone visits your website or comes to your store. Plain and simple. Today, we’re going to focus on how you can use website sign-up forms most effectively by focusing on using a dynamic sign-up form. What do I mean by dynamic sign-up form? Typically, when you visit a website, you’ll see a static form embedded somewhere on the page. These inline forms rely on your visitor seeking them out. It’s passive. A dynamic form, on the other hand, is active. It presents itself to your visitor after a specified period or when they’re about to leave your website. What’s exciting about these dynamic forms is that for our customers at Constant Contact we’ve seen them increase email signups as much 150 percent. Find out how to set up and set the timing on your Constant Contact pop-up sign-up form. I know what you’re thinking. Ugh, I hate pop-up forms. Right? Here’s the thing, most people aren’t using them the right way. And it’s hard to argue with the effectiveness of these forms. So let me give some tips on how to use these forms the right way, so both you and your website visitors don’t hate them. Tip one: Stop saying, Join Our Email List! I can’t wait to get more email today! Said no one ever, right? That’s one reason why people hate sign-up forms. They’re interrupting you and not providing any value. Instead, focus on how you can provide that additional value. Which leads us to the second tip. Tip two: Focus on what’s in it for them if they give you their email address. We asked consumers why they subscribe to email lists. Here’s what they told us. What could your pop-up sign-up form look like if you focused on one of these reasons? Let’s take a look at some mock examples. Here’s a retail example from Southside Cycling. This dynamic form shows itself after someone has been on the site for at least 15 seconds. These days if someone stays on your site longer than that it’s a good indication that your visitor hasn’t given up on you yet. 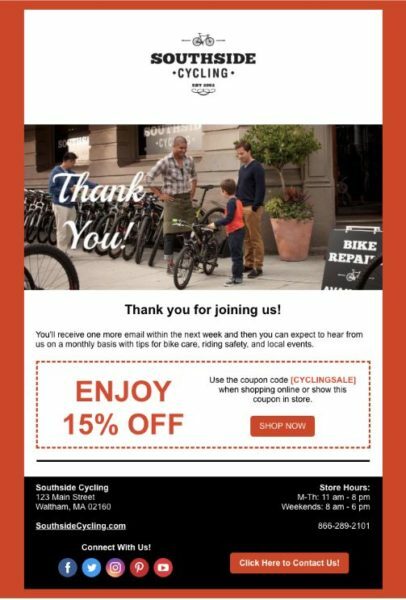 In the above example, Southside Cycling offers new contacts a 15 percent discount off their next purchase in exchange for their email address. Notice how this form focuses on the offer, not the email list. Maybe a discount offer like this makes sense for your business. In this dynamic form from French Consulting, the business focuses on the value of the free consultation. The pop-up form also lets people know that they’ll receive future emails with exclusive content to help them market their business. Is there something your services business can offer people in exchange for their email address? Perhaps an educational eBook, whitepaper, or a step-by-step guide. 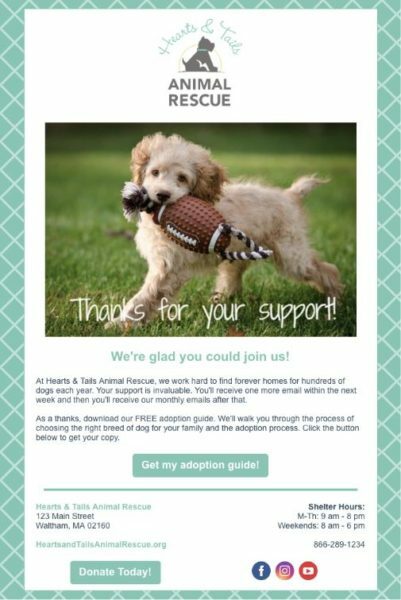 In this dynamic form from Hearts & Tails Animal Rescue, it’s all about providing a free adoption guide. This valuable resource for new contacts helps both the contact and the organization accomplish its goals. As a nonprofit, how would you entice people to give you their email address? These are just a few pop-up sign-up form examples to get you thinking. Feel free to use any of these ideas and adjust them for your needs. When you use a dynamic form in combination with these types of offers, you’re not just interrupting your website visitors, you’re presenting them with something they may find valuable. Now once these people join your list, how do you take advantage of this highly-engaged time? Constant Contact customer, Peter Lovis, owner of The Cheese Shop in Concord, Massachusetts, has a sign-up sheet at his register for what he calls his sometimes monthly email newsletter. Now, it may be an honest description. But there’s something wrong with this undisciplined line of thinking when it comes to how often to send an email. Let’s imagine a likely scenario, and it may be one with which you have some familiarity. Someone decides to subscribe to this sometimes monthly email newsletter and since Peter just sent his newsletter the day before, sometimes monthly ends up being three months before this new subscriber even hears from The Cheese Shop in their inbox. After that long of a gap between signup and first communication, it’s likely this new contact may have even forgotten that they signed up in the first place. The contact may even mark the message as spam. And so Peter has missed out on a period where a new subscriber is most likely to engage with his business. That’s too bad considering Constant Contact data has shown that welcome emails have about a 50 percent open rate. That’s a big jump compared to an average of 16 percent across general emails. See how your rates compare against average industry rates for email. Have you ever experienced a situation similar to the example above? The good news is that you can take advantage of this period by using a simple, automated welcome series to engage your new contacts. Whether they sign up today or a week from today, they won’t have to wait to hear from you until that next monthly newsletter. So, what should you include in your automated welcome series? Note: Yes, there are more robust automated welcome series you can create. Your needs may vary depending on your specific situation. The purpose of this simple welcome series example is to get you thinking but it will also serve the immediate purpose of immediate engagement important to your business. Welcome series, Email 1: Welcome/Delivery email. 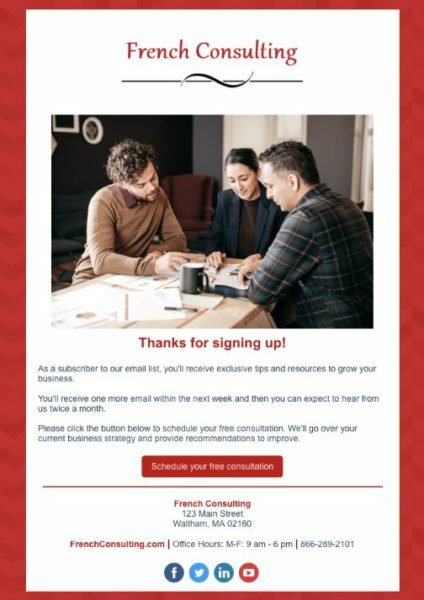 If you’ve followed the advice from the first section and offered your subscriber something in exchange for their email address, you should send this Welcome email immediately after they sign up. You’ll want to deliver what was promised, welcome your new subscriber, and reiterate what they should expect in the future. Simple. Let’s take a look at the second email. The second email you’re going to send in this short series is what we call an Invitation to Connect. You should send this email a few days after your Welcome email. What’s the purpose of the Invitation to Connect? Here you’re going to let your subscriber know of the other ways in which they can engage with you, this will most likely be on your social channels, and invite them to connect with you. 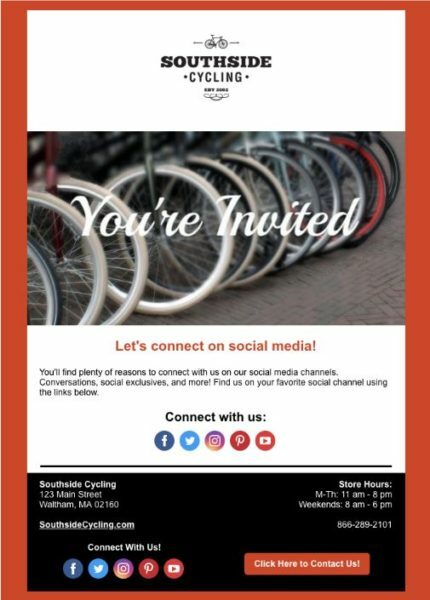 This email is important because once your subscriber connects with you in other locations, you have multiple ways to engage and stay top of mind with your customers. And if your subscriber engages with you on these public forums, your business gets exposed to their connections who are likely also to make excellent prospects for your business. Here’s how the Welcome series looks across our the rest of our example businesses. Now, what happens in the future? Your approach should be to do more business by sending more timely and relevant emails. You can accomplish this task with the help of additional email marketing automation. We’ve already mentioned how important relevancy is to your customers. We’ve also mentioned how difficult it can be to keep up with even a “sometimes monthly” email newsletter. But what if I told you could ensure you’re sending timely and relevant emails to the right people at the right time increasing the effectiveness of your messages? To do this, we’re going to use click segmentation and automation together. Click segmentation automatically categorizes your contacts into a list based on a contact’s expressed interests and email engagement. 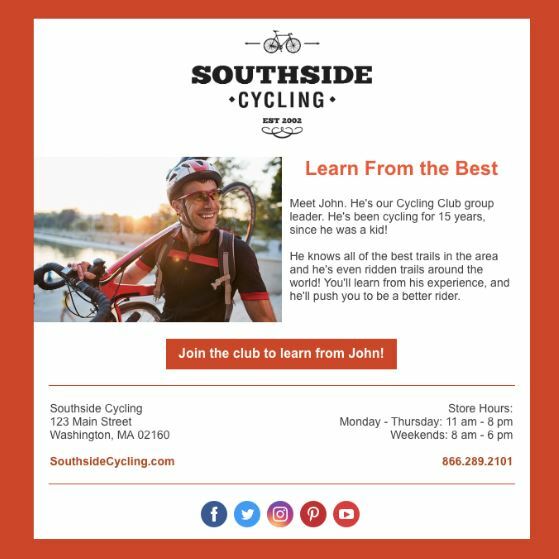 Southside Cycling knows that people who are part of their cycling club end up spending more than those who haven’t joined. 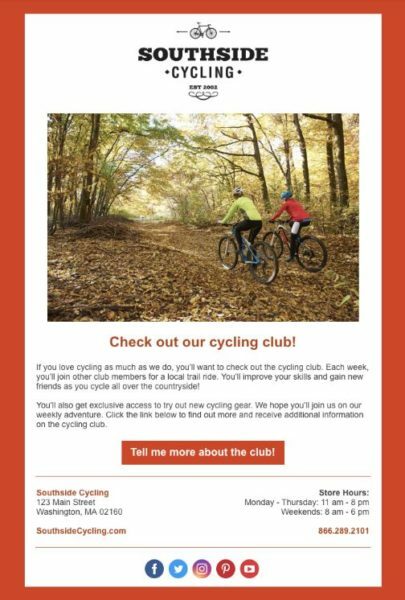 So they send an email about their cycling club to their general interest list. 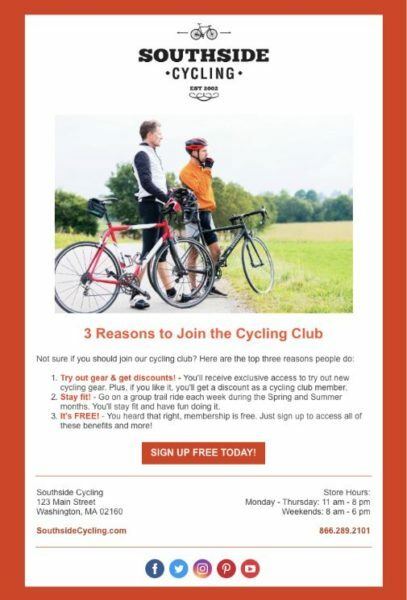 They send this email with the goal of allowing people who may be interested in the club to self-segment themselves into a Cycling Club Prospects list by clicking on a link to find out more. Here’s an example of the email to find an interested audience. 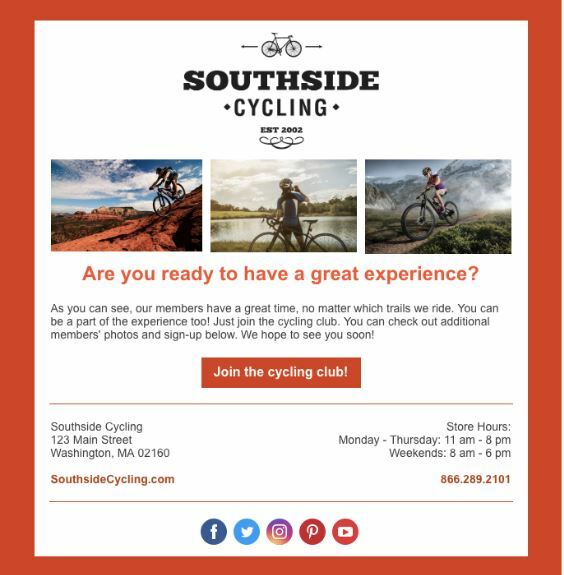 Once a contact clicks the link they go to a page with on Southside Cycling website with more information. Behind the scenes, click segmentation adds these clickers to the Cycling Club Prospect list which triggers an email automation series to send follow-up information. In this scenario, the contact receives three emails, at varying frequency, highlighting an aspect of the club and enticing contacts to join. We call this automation an Action Series because our goal is to get a contact to take a specific action. Feel free to copy this three-email series. Think about how you might modify the series for your needs. 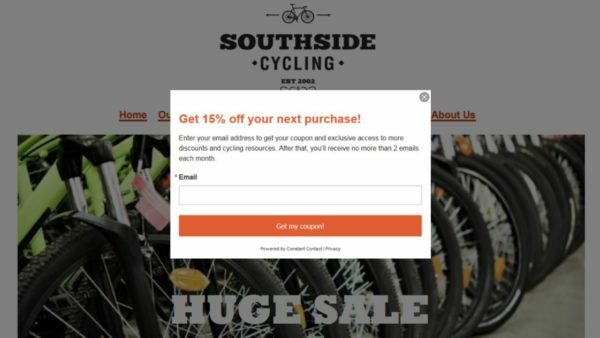 Let’s take a look at how Southside Cycling implements the emails in this series. The first email highlights the reasons why someone would want to join the club. The second introduces a unique aspect related to the club, in this case, the club leader. The third email shares some photos from other club members having a great time on their club adventures to invoke the fear of missing out. Let’s take a look at this Action Series email automation applied to our services business example. 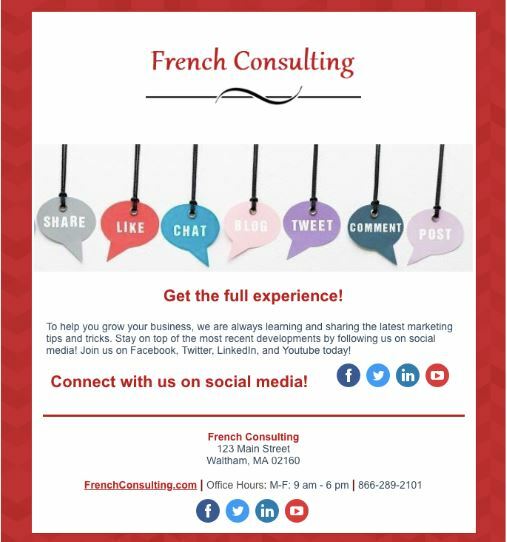 French Consulting wants to find some prospects for its website redesign services. Here’s how they implement the same approach. 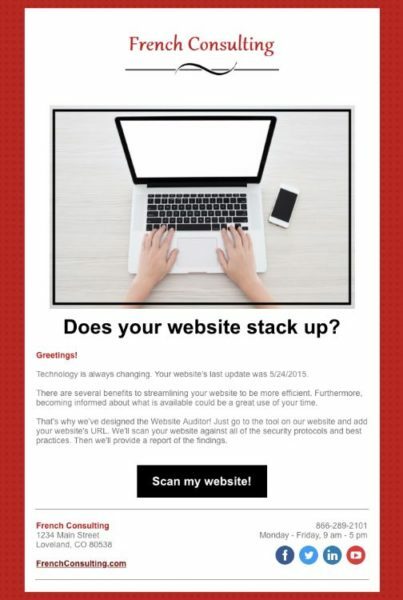 To gauge interest from its existing contact list, French Consulting sends an email letting contacts know about a free website auditing tool they can use to know if their website is in need of updates. Once a contact clicks the link they’re taken to the tool. Behind the scenes, click segmentation adds these clickers to Website Redesign Prospect list which triggers an email automation series to send follow-up information. Here’s how French Consulting applies the Action Series. 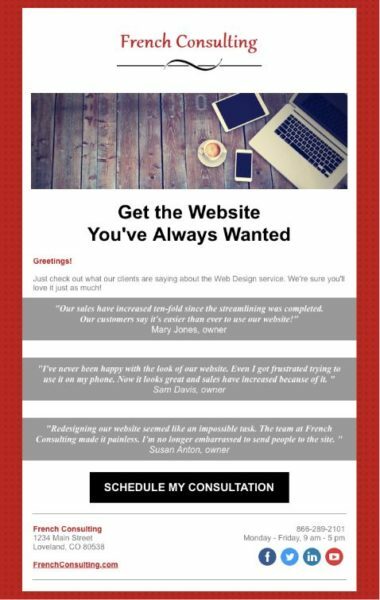 In the first email of the series, French Consulting highlights some reasons why their prospects may want to consider redesigning their website. 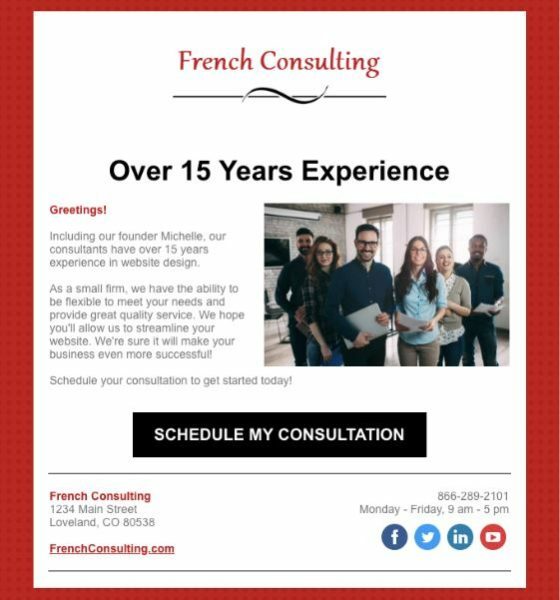 The second email focuses on the unique perspective French Consulting offers from many years working with small businesses. 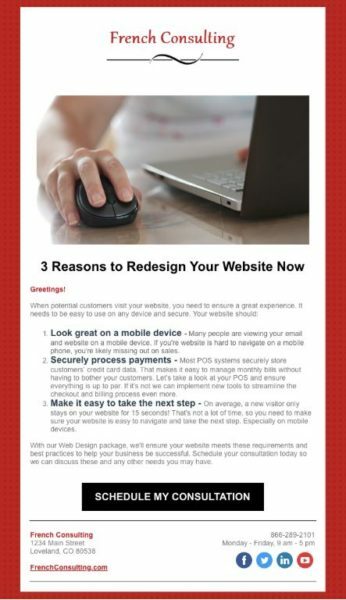 The third email highlights some testimonials from happy customers of the website redesign to show what potential customers may be missing out on. And here’s how our nonprofit could apply the Action Series email automation. 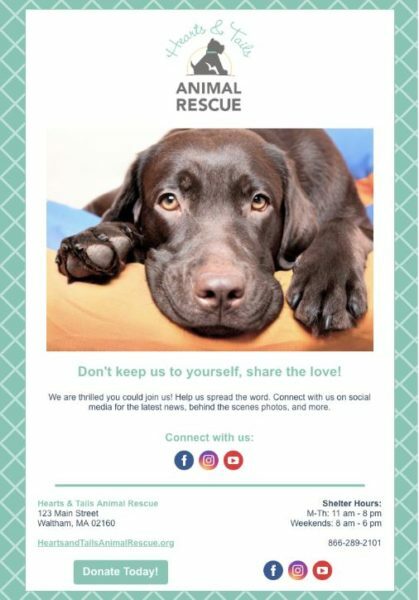 Hearts & Tails Animal Rescue wants to find a forever home for a new animal at the shelter. Here’s how they apply the approach. 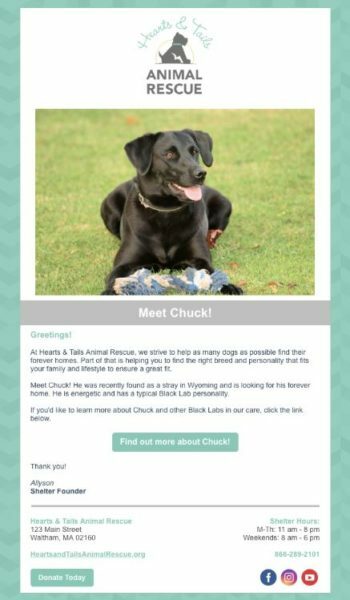 To gauge interest for Chuck, a new dog available at the shelter, Hearts & Tails sends the following email. Same scenario here. A contact clicks a link expressing interest in the dog. Behind the scenes, click segmentation adds these clickers to the Chuck Prospect list which triggers an email automation series to send follow-up information. Here’s how the Action Series is modified for this use case. You guessed it. 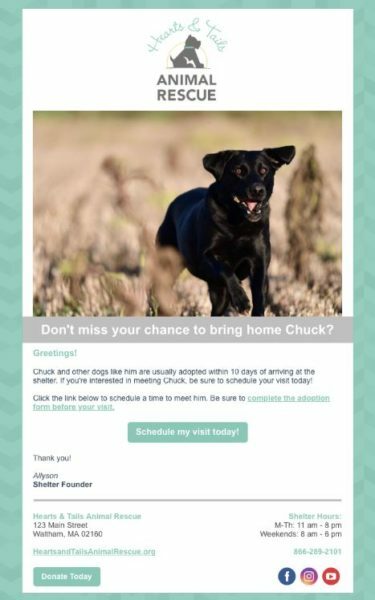 In this first email, the rescue shelter highlights some reasons why someone would be interested in adopting Chuck. 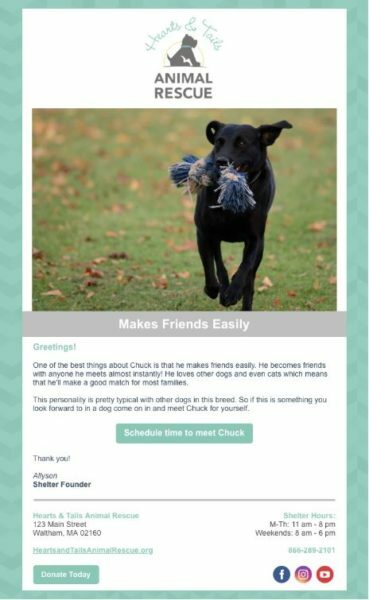 In the second email, the shelter focuses on the fact that Chuck makes friends easily and is a good match for families with children. 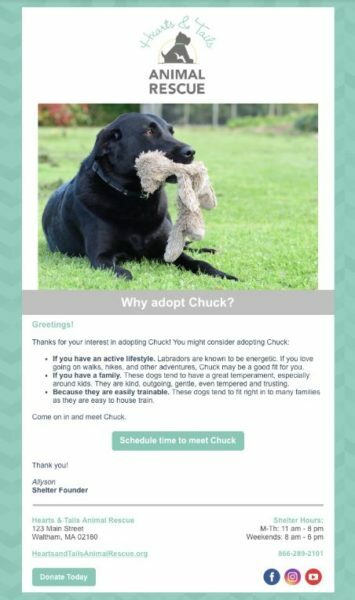 And in the final email of the series, the shelter gives details on how quickly dogs like Chuck are typically adopted. This encourages people thinking about it to act soon as not to miss their chance of bringing Chuck home. Are you seeing the potential for how to use email automation? Hopefully, you’re seeing how you may be able to apply something similar to the Action Series email automation for your own needs. You can put your marketing on autopilot. By following the ideas I gave you here today, you’ll be able to retain your existing customers better, find more new customers, and save yourself precious time. Start getting new business today! If there’s one thing you can do today, look into creating a pop-up sign-up form. The more people you have to contact, the more opportunities you have to increase your business. May your business always be moving up and to the right. 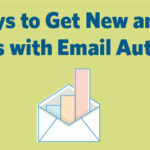 The post Some Ways to Get New and Repeat Business with Email Automation appeared first on Constant Contact Blogs. This entry was posted on Wednesday, April 17th, 2019 at 9:54 am	and is filed under Automation, Email Marketing, News & Updates, Nonprofit. You can follow any responses to this entry through the RSS 2.0 feed. Both comments and pings are currently closed.